Photography involves humans in unexpected and magical ways. Outside of all concepts, it succeeds in touching its observer. By association, it finds its way into the human conscience to become part of its memory. 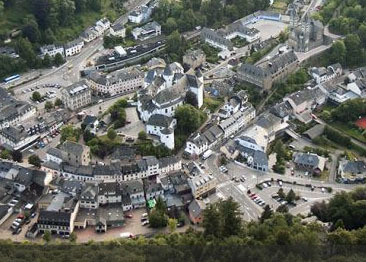 The present open-air installations in Clervaux imply an ecological, social or poetic involvement. They evoke a technical process that combines concrete and virtual realities. Their research takes place on an urban scale, questions the landscape, shines with the author’s passion and engages in a debate at European level, going so far as to adopt a global vision. They furthermore allow an additional approach, namely that of sensitive contemplation pitting itself against intellectualism. Photography rejoices in every glance. Catherine Balet set out to discover adolescence, during which the question of identity is possibly at its most pronounced. The photographer succeeded in creating a portrait that illustrates both the impact of the individual character and the manifestation of the spirit of the time: the subjective and unique image of the individual disappears against the collective memory with its repetitive and global traits. In faraway countries and cultures, the cow is revered; most Europeans think of nothing other than food when they see a cow. Ursula Böhmer has created a dignified portrait in telling a story that is both simple and fascinating, namely that of the “cows in Europe”. “My home is my castle” is a popular saying that has been attributed to the Englishman Sir Edward Coke. Comparing houses with castles lends stability to the house. That said, this reflection does not align with Laurent Chéhère’s vision. He lets houses soar, like rooftops held by filigree lines, ripping them from their static state and likewise out of their real context, which coincides with the 19th and 20th arrondissement in Paris. “The World We Live In” is a colourful portrait, romantically cultural, functional, disciplined and varied, proud, a little crowded, seductive. Partially fossilised, intimate, wild, free, dustily geometrical, plastic and hollow, decoratively ornamental, inhuman: terrible. Oh yes, and let us not forget, cold, funny, dangerously costly, marvellously insolent, vigorous, but also adorable, a little bit – fuzzy? Alive really! What do you want? When man lacks awareness and allows carelessness to occupy its place instead, industrial waste ends up being thrown in the sea! The sea gives back all it receives, the waste thus rising back to the surface. Not long ago abandoned by man, the debris waits for the moment to confront its creator. The ensuing face to face is dramatic. One appears surprised, thinking he recognises a familiar face? The other is imposing, at the same time inert, and remains – without comment. Klaus Pichler presents a study on allotment gardens. The microcosm of the small garden is characterised by a particular morphology. The photographic work describes how this utopia adopts real character on the outskirts of large metropolises. The photographer subtly redraws the contours of a sometimes grotesque formalism, which is always very orderly as a result of a slightly pedantic domestication of nature, yet always carried out with love and skill. In Julia Willms’ digital collages, open landscapes occupy the closed room. Urbanity – structural substance – surrounds nature, peacefully. The landscape within the house becomes the counterculture of the familiar, the architectonic frame becomes the living space of another, albeit familiar, world.